When I started to see posters appear on the Underground advertising the upcoming film of Sara Gruen’s Water for Elephants, I decided that it was probably time to get the book down from my shelves and read it. Although this review has been so long in the writing that the film has now been and gone from cinemas without my having seen it, from having read the book I’m sure it must have made a great film. There are some books which ask you to engage your critical faculties and revel in the impressive language, and there are others which keep any high-minded ideas you might previously have had about literature and good writing firmly under lock and key as you are swept away by a rollicking good story. Water for Elephants definitely falls into the latter category. The novel is narrated by nonagenarian Jacob as he sits in his care home watching the circus set up from his window, sparking memories about his own time working for a travelling circus during the depression era. While working as the show’s vet he quickly falls in love with Rosie, the circus elephant, and Marlena, the girl who rides her. However, Marlena is married to short-tempered, brutal August who also happens to be Jacob’s boss. In spite of the obvious dangers, Jacob cannot forget his feelings for Marlena, and soon August’s cruel treatment of both her and Rosie proves too much for Jacob to bear. 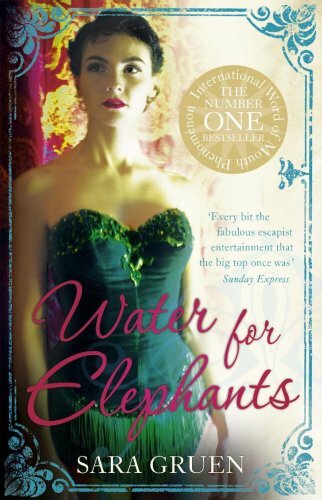 Water for Elephants may not be the finest piece of writing that I’ve encountered this year, but that doesn’t mean it wasn’t a highly enjoyable book. It’s the sort of novel which prompts the reader to devour it with gusto, racing through the pages, carried along by the rapidly moving plot. I think it’s very telling that, even though this book has over 400 pages in the edition that I read, I polished the whole thing off in less than a day. I was totally absorbed in Jacob’s life in the circus and the dilemmas and hardships he faces. This book is all about the plot and that story is exciting and great fun to read. Far from running away to the circus being an idealised dream, Gruen presents life on a depression era circus train as a gruelling, dirty, unhygienic experience. The animals are either half-starved or living on rotten meat; the only time the lions get anything fresh is when one of the horses dies and is fed to the hungry creatures. I’ve read quite a few reviews of Water for Elephants which object to the book because of the animal cruelty it depicts, but I thought that this approach, so different from what I was expecting in a book set in the glittering world of the circus, made the story far more interesting and realistic to me. On the negative side, this is yet another book which is written in the present tense for no apparent reason, something which I find incredibly off-putting unless it is very skillfully executed. I don’t think it was in Water for Elephants. Particularly after reading Human Croquet recently and admiring the way in which tenses were employed there, it made little sense to me that both the sections set in the nursing home in the present day and the parts set in the circus in the past were written in the present tense. In fact, I didn’t think that the frame narrative of the older Jacob looking back on his younger days added anything to the book really. Although the speed at which I inhaled the story prevented me from being too distracted by it, nonetheless I would have much preferred it if it had been written in the perfect tense. In spite of my niggles about the writing style, this book is not one to read for the style but for the excellent story. It is a good fun read and was the perfect novel for distracting my mind from wedding planning for a bit. Water for Elephants by Sara Gruen. Published by Hodder, 2007, pp. 429. Originally published in 2006.